Inside the home, a lot happens. Kids run wild, messes are made, decorating commences, and sometimes even renovations occur in the pursuit to make your home the ideal oasis. Each and everything that transpires inside your home can have a direct impact on the environment and air quality within your house. Maybe you cleaned your home with a strong cleaning agent, had new carpet installed, painted the interior of your home, or if you had a remediation job completed in your home from a leak, mold, or other indoor contaminant outbreak, all of these things can drastically impact the quality of the air inside your home. 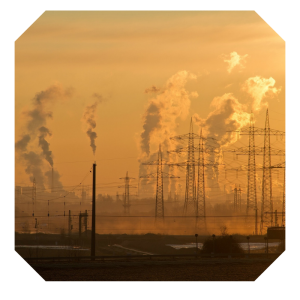 Often times, when we think about air pollution, are minds usually travel to outdoor air contaminants such as – smog, ozone, or haze that lingers in the air. Although outdoor air has many contaminants that plague the air quality, the contaminants inside indoor environments can often times be far scarier than you would have ever anticipated. The EPA’s Office of Research and Development conducted a study in which it was found that levels of about a dozen common organic pollutants were 2 to 5 times higher inside homes than outside – which leads to potential hazards to human health as the average American spends close to 90% of their time indoors. Volatile Organic Compounds (VOCs) are chemicals that are emitted as gases and can be found in everyday items you use in your home. 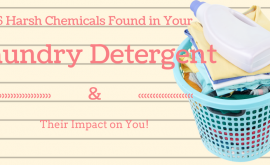 These chemicals are introduced into the home from many household products and building materials used throughout the environment. Once these chemicals are in the home, they will begin to release or “off-gas” into the air that you breathe every day. And if a smell develops in your home, that is a bad indicator of potential issues with your home’s air quality. VOCs present many health effects upon exposure or inhalation of these chemicals in the air. The severity of health issues is dependent on the number of VOCs and how long or often a person breathes them in their body. Breathing in low levels of VOCs for a long period of time can increase some people’s risks of health problems but studies have shown drastic health effects occur in people with asthma or sensitivities to chemicals. Items inside your home that are producing VOCs may surprise you – some of the most common VOC sources could be the most inconspicuous. The candle you light inside your home, your go-to all-purpose cleaner, or even the perfume you spray on yourself everyday can all produce VOCs inside the home. Other sources of VOCs indoors can include building materials (plywood, particleboard, and glues), burning of fuels (gas, kerosene, wood, and tobacco), and personal care products (hairspray, perfume, cleaning agents), and paint. 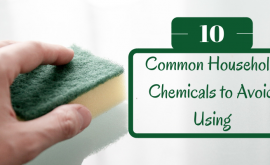 However, more specifically, typically anything new inside your home like new cabinets, flooring, or furniture are likely emitting several VOCs into your home, tainting your indoor air quality. There is a long, extensive list of VOCs, some of which can be contained within the air in your home. The hazards presented to human health can vary depending on the specific VOC in the environment. Some VOCs are fairly common that many people are aware of and some are names that you may have never heard before. Below are the names of the top 10 most common VOCs in American homes. Have you recently added new furniture to your home? Painted? Changed cabinets? Installed new flooring? If you answered yes to any of these, the chances are these items were loaded with an amalgam of VOCs that will begin to off gas inside your home quickly following its arrival. Unfortunately, we are many times unable to avoid the introduction of VOCs into the home. Although, as the issue of chemical usage in the manufacturing process have been strongly protested against by environmental groups, more and more companies are developing/manufacturing environmentally friendly products and technology to help with the reduction of VOCs inside the home. Key indicators of potential off-gassing occurring inside you home can range from an odor, a stir of health issues, or even using a special meter for measuring indoor air quality inside your indoor environment. The best way to reduce the amount of off-gassing in your home is to search for products with either reduced VOCs or no VOCs. 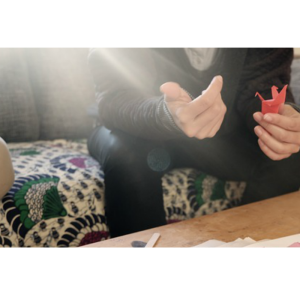 However, this is no easy task, as many companies ‘claim’ to utilize limited or no VOCs just to appease the customer- with no evidence in this claim. Also, these products can be quite expensive and may not be feasible for the everyday consumer. Thus, leaving your home a potential threat for VOCs when utilizing products that are affordable inside your home. 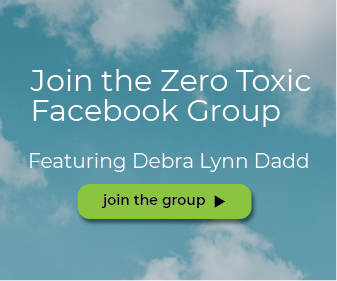 What can be done when VOCs contaminate your home to the point that you cannot even be inside your house? Many people face health conditions that make it hard to be in environments where VOCs are high, and this can lead to major issues when the said environment is your home. Often times, people will try relentlessly to remove the source(s) of the VOCs inside their home but as thorough of a job as you do in trying to remove the VOCs from the surfaces of your home, your air is still left untreated and leaving your home with still a significant number of VOCs inside. If you are left with a severe reaction to the VOCs in your home, you may have to consider the process of ‘Baking” your home. A property bake-out can be extensive and require specific equipment and gear to work completely. The steps below are a full-proof guide to correctly conducting a bake-out of your home for VOCs. 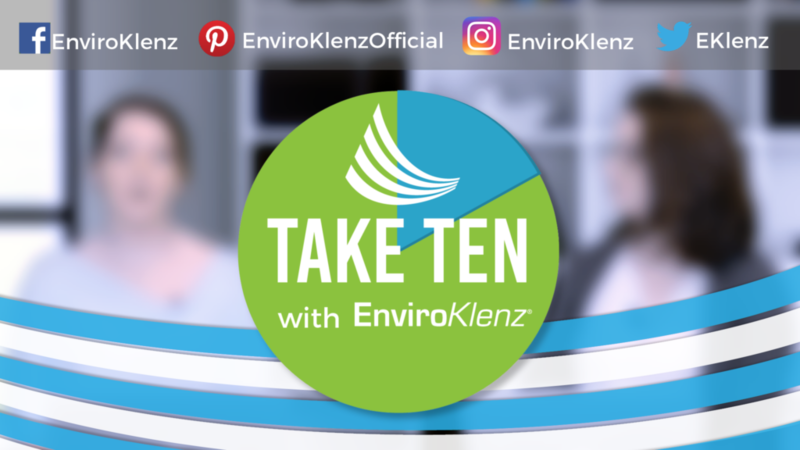 The EnviroKlenz Air System is a safe and effective process to eliminate odors in enclosed spaces and provides faster odor elimination capabilities, a safer environment, and the ability to speed the off-gassing process of VOCs tremendously by removing and neutralizing what’s in the air. This VOC Air Purifier does not release any chemicals/molecules into the environment, instead it utilizes a patented technology that breaks down chemicals and destroys them from the environment. This system will treat up to 7,500 cubic feet of area. First, you will want to locate the source(s) or area that have the strongest odor and calculate the cubic volume of the area that needs to be treated to determine the recommended number of EnviroKlenz Air Systems and/or HVAC filters to be used. Strategically place the VOC Air Purifier in the contaminated air space that will provide the most impact. 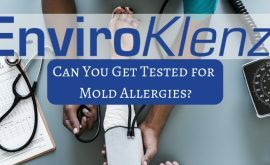 Once you have strategically placed your EnviroKlenz Mobile Air System in the contaminated area, turn on the System – because the system is safe and does not release any chemicals into the air it is okay to use around sensitive fabrics, plants, pets, and people without any special precautions. **Be sure to remove filters from furnaces, air conditioners, heaters, and humidifiers as these can trap and hold the odor residues which will restrict full circulation of air. 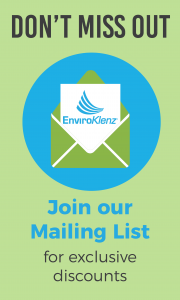 The EnviroKlenz HVAC Filter can help in the process and may be installed. Seal off any opening or ducts that lead to the treated area and open or remove interior doors, passages, trap doors, cabinets, lockers, ceiling tiles, and access panels that can block access to areas you need to treat. After you have opened all doors and cabinets to expose all surfaces, you can turn up the heat in the home to elevate the temperature. Additional safe for indoor use heating device can also be used to heat your home, but DO NOT use outdoor heating devices inside. Have the EnviroKlenz Mobile Air System run for the duration of the heating process – the total job time is dependent upon odor concentration, treatment area, source odor treatment procedure success, and environmental conditions. As the home temperature begins to elevate and noticeable concentrations of odors continue to rise this is the result of the bake-out process which is driving off the chemical odors. The EnviroKlenz Mobile Air System will be capturing the odors. To help facilitate this process, a quick exchange of air is recommended. This would include a rapid release of the internal air to bring in fresh air from outside (fans, fresh air, etc.). This process is often called a flush out and is effective in conjunction with EnviroKlenz Air System. Following these steps can be critical to eliminating VOCs from your home’s air and restoring your home to conditions that are livable once again. Can you please explain what the patented technology is that neutralises VOCs? Is it photcatalytic conversion? We do not use PECO nor do we release any chemicals into your air or environment. 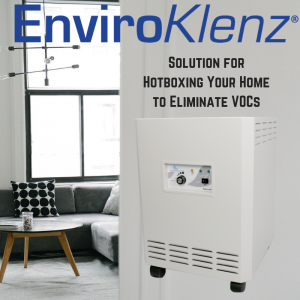 The technology behind the EnviroKlenz Mobile Air System utilizes advanced, patented materials to safely neutralize a broad spectrum of toxic and noxious chemicals and odors, making it one of the best air purifiers for allergies on the market. These earth minerals have a high surface area that gives ample active sites to contact the chemical pollutant, but they additionally can break down chemicals through a variety of chemicals mechanisms and pathways, safely. This is a significant advantage over carbon media which does not break down chemicals, meaning they could be released back to the environment. Due to this technology, EK Mobile is considered one of the top of the line, one of the best air purifier options around! 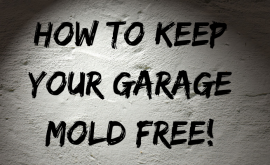 How To Keep Your Garage Mold Free!